The Cheyenne Mountain ZOOMobile visits Cave of the Winds Mountain Park! Such fun with the Cheyenne Mountain ZOOMobile over the weekend! 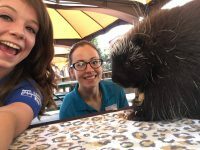 We even had porcupine high fives and selfies! Thanks to everyone who came to see and learn about our North American animal friends and many thanks to the Cheyenne Mountain Zoo for sharing!